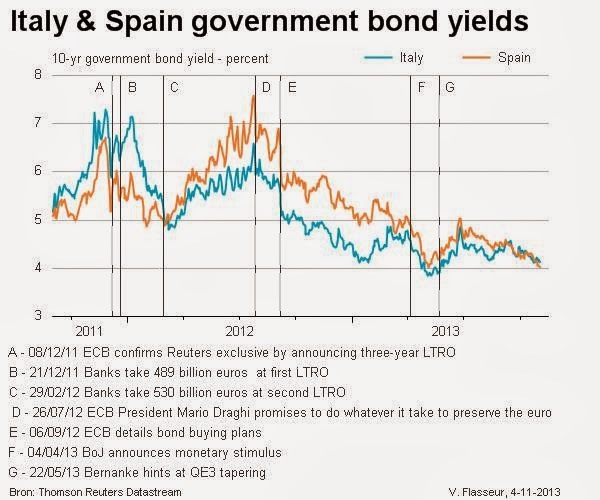 This chart from Reuters (V. Flasseur) shows the 10 year government bonds yields for Italy and Spain. With Italy's yield spiking above 7 percent in 2011 and Spain's yield spiking above 7 percent in 2012 both countries saw there interest rate come back to just above 4 percent now. Some policy events are also added in the graph.